I got to the small enclave of white and green buildings. I took a breath, it was fresh, it didn’t smell like garbage, open sewer, or damp mold. It was odd. I was alone in this experience, there was no going back. There I was, in a tiny town in Ontario, at a co-ed boarding school. My parents had dropped me off, my Father had given me a hug, looked to the ground, and said sorry. I tried not to cry. I knew I had to be here, Caracas had become unmanageable (I had already lived through a drug raid, a coup attempt and a shooting), and my Father feared for my safety. It was the first time I would be separated from my parents, and I was terrified. I was 17. I hadn’t chosen the school, my Father had picked it. Wanting me to be far enough away from Ottawa, wanting me to be away from other Diplomatic Kids, and from my first day at this tiny school, away from anything International. My first week, I realized, I was so very different. The way I thought, my gestures, my experiences, were completely foreign, and it was obvious. I had learned from a young age, how to blend in, how to adapt to a new surrounding. I just hadn’t counted on not being able to escape. Whenever we moved, I had a home to go back to, a bedroom where I could be alone, I always had space. At boarding school, there was no space, no place to call my own. Even in the bathroom, there was no space. You showered and peed next to other girls, sure there was a divider, but there was never any real alone time. So it began. A game I tried to mask. By day I attempted to keep it together, to assimilate to the culture of the school, but by night, I began my cycles of insomnia and sat in the shower stalls listening to my Walkman or reading a book. My irrational anger began to surface. I took out my irrational moods on friends, and younger students, then breaking down in tears, not knowing what was going on with me. It didn’t happen often, but when it did. My brain would be horrified, but I had no control over the emotions. When I tried supressing my feelings, I began to throw up uncontrollably from my anxiety, then the nightmares would start, sometimes the nightmares would come when I fell asleep in class. I would startle awake. My first 4 months of school were brutally slow. I had gained a boyfriend, but didn’t realize I was morphing and taking on everything he liked, not really being me. I didn’t realize that I was becoming 2 separate people. I arrived back in Caracas. I got off the airplane, and everything became familiar again, my father stood outside of the gate, and I ran to him, feeling for the first time I was home, I could be me. I burst into tears. My Father stood there, rubbing my back. The 4 months of being someone else melted away, and I could finally sleep. On the long ride back home, my Father asked if I was sleeping. I replied “no”. He nodded. We had talked about my lack of sleep before. I rarely slept. He asked if I was still taking the back medication I had been prescribed. I replied “no”, it made me more jittery. He nodded. He didn’t say anything. We both knew what I was suffering from, but there was no word for it, there was nothing I could do about it. I had been taught to have a stiff upper lip about it. If I pretended hard enough, it didn’t exist. What I know now, is you can’t pretend PTSD away. There is no ignoring it. That night, I slept like a log. Sure, there was sounds of gunfire in the distance, but I felt like I could breathe again. I was home, with my parents, and my dog. Christmas break was insane, it felt like it went by quickly. I had to face I was going back to school. I arrived back to school tried to settle in. To be honest, I never really settled in. I became 2 different people. I tried to be as Canadian as possible at school, not talking about Venezuela or my diplomatic life, but I could never really become Canadian. At home in Caracas, I told stories of school, but pretended everything was fine for my Mother’s sake. My Father told me not to share how unhappy I was. Sleep became easier as my PTSD lost its grip on me. The more I pretended at school, the easier it became. 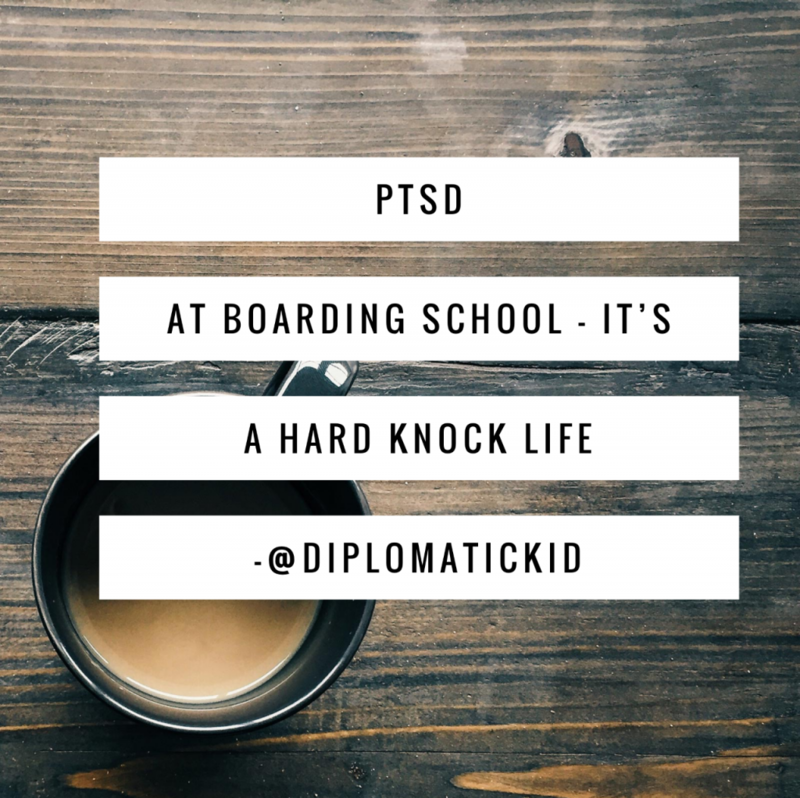 I wouldn’t know until years later that PTSD can come and go for people like me. It was all good. Lying to myself that I could identify with my classmates in this small town boarding school became easier. In many ways, I started believing I was this person. Which made me more insecure and less confident. Culture and Identity would slowly break me down.